Skunks are nocturnal, reclusive animals of the weasel family. They are omnivorous feeders. They will just about eat anything, including; insects, grubs, snakes, fruit, vegetation, small rodents, eggs and garbage. Skunks are active all year. They will sleep for several days during very cold weather. but they do not hibernate. The strong sulfurous musk they produce as a self defense mechanism makes them undesirable in and around living areas. 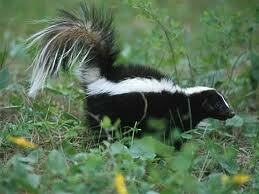 Skunks are involved in human exposure to rabies more than any other species of wild animal. While rabies is rare in Idaho please be aware of the symptoms. Signs of a skunk with rabies include: wandering around listlessly in the daytime, no fear of humans and aggressive behavior. If you have a skunk Cook Pest Control can help you remove it. Contact Cook Pest Control to handle all of your home or business insect extermination,skunk control, animal removal or exclusion and ALL your pest control needs in the most effective and responsible way possible.